Looking for gifts for your customers, business partners and employees? Give the Gift of Austrian Goodness! 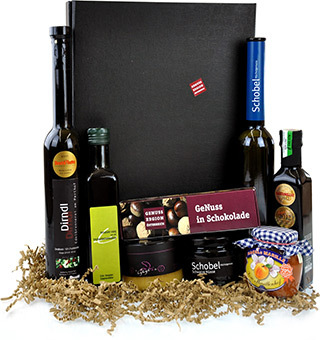 We provide the perfect gift package containing 100% Austrian products of the highest quality. Here you will find regional specialties, classics and award-winning rarities. We are happy to deliver your self-compiled gift sets on the delivery date selected by you. Whether it be for Christmas or Easter, birthdays or anniversaries, our culinary surprises are always the way to go. Choose from our various gift packages. Rustic wooden boxes, elegant, dark gift box or simply a beautiful cardboard box - we have covered all the bases. Our products are beautifully wrapped in natural-coloured Sizzle Pak and corrugated cardboard is used for optimum protection of products. For a small fee, you have the option of choosing from a variety of Sizzle Pak colours. We are happy to take care of the shipping for you. We deliver your package - depending on the size of the order - with the Austrian postal service on the date selected by you. The costs are calculated depending on the size of your order. The shipping cost is calculated depending on the size of the order. A folder can be included in the package if so requested. Become a Genuss Region Supplier! Glanz-Pöltl Orchards Grape Frizzante "Annalena"